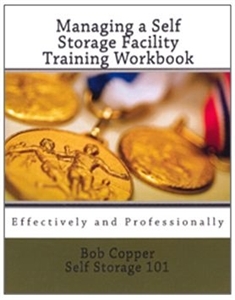 This workbook is a companion training tool for the book "Managing a Self Storage Property Effectively and Professionally," also authored by Bob Copper. Facility operators can use these resources in tandem as part of their own in-house training program. The workbook walks the facility manager through the tools for operational success in an easy-to-understand manner: sales, collections and time management. To learn more about the companion book, click here. To purchase a combination package that contains both products at a discounted price, click here.